In the article, Folly of Faith, Folly of Reason, one of the things I argued based on Isaac Asimov’s short story, “Reason” was that point of view on topics beyond the dimensions that we can observe is based on emotion. The article made a lot of my science-minded friends a bit unhappy, but led to some great discussions. Below is a somewhat edited version (taking out any personal references and cleaning it up) of an online conversation I had with a friend where we explored the topic further. We started out on vastly divergent points, my friend being what I would call a “hyper-rationalist” and myself being something of a self-proclaimed “rationalist leads to belief in things beyond what we can see”-ist. We do, at least, agree that we should start with postulates that we want happiness and meaning in life and I think my friend began to see where I was coming from. I argued that we can look at anything and see the negative or see the positive and that leads us to belief in a Creator who made us for a purpose (something akin to the robot in “Reason”, actually). The conversation follows. The headings are added for readability. Friend: Your Folly of Reason image resembles an incomplete representation of the Radon Transform used by CAT Scan imaging. The third light source is missing. You’d still be guessing if you said this object was a cylinder as you still cannot prove the objects opacity in all three dimensions. 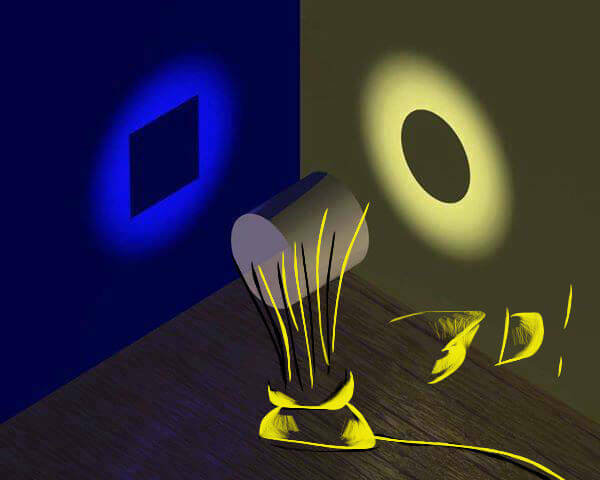 However, three ‘orthonormal’ light sources will give you the ability to establish the shape of the object leaving zero room for doubt and one’s emotional interpretation. Me: Nice cold, hard reasoning. Friend: We need to be certain before we operated. Me: The image is just a metaphor – it’s harder to draw showing the 3rd and 4th dimension. We can understand 2nd vs. 3rd though. Friend: I stick to the three physical dimensions known as Hilbert Space. The other dimensions and the nature of 95% of the universe (dark matter and energy) is yet to be defined. Me: Quantum theory calls the 4th dimension time or duration. We live in the 3rd dimension but still have a ‘flat’ view of the 4th. The picture shows the concept of living in the 2nd and imaging the 3rd, though we don’t need to imagine the 3rd…it’s a comparison. Friend: Our observations are blind to those extra dimensions, but absolutely certain in the dimensions that are appropriate for the measurement. The difference between opinion and science is having a ‘spanning data set’ which covers all dimensions relevant to the conclusion. Psychology is not considered by science to physicists. Friend: That’s debatable. We can and often do treat it as a dimension, though. Me: I don’t think our observations can really tell us that. Friend: it depends on what you are trying to prove. Me. That is based on the postulate that you start with. That was Asimov’s point which I wholeheartedly agree with. Me: His point is that by using logic and reasoning alone, you can prove anything (philosophical) you want depending on your starting point. The starting point, however, is based on emotion. A ‘rationalist’ will choose the starting point as ‘only what I can observe is truth’. I find that to be irrational. Friend: That isn’t true. You cannot prove something that is false unless you are a working in ‘cargo cult science’ [a reference to the Asimov story]. That was a Feynman reference. Me: That is when you have all the information… for the shape of a three dimensional object, that is true (assuming there is no fourth or fifth dimension to it that we can’t see). However, our lack of ability to see the object in another dimension does not mean it is not there. We become just like the ‘cargo cult’ robot in the Asimov story. Friend: it is yet to be established. Friend: Do we care that the kidney stone we are illuminating with x-rays from three dimensions is blinking on and off in dimensions 23-56? Me: Probably not. It’s much easier to disprove the logic of something than prove it. My point wasn’t really to prove anything of the sort. Friend: Dimensions 1-3 are good enough to tell the surgeon to start cutting. Or do you have another point? Me: I agree with you and understand what you’re saying. I’m not arguing that any of it is incorrect or even arguing that I know or can prove with any certainty that there is anything beyond that. I am, instead, arguing for the limitations of this mode exploration. Me: There may be more that we can access (for which, with a yarmulke on my head, obviously I do believe). Such modes of exploration cannot be used to show absence of such higher powers and causes. As such, I then disagree with people like Asimov (don’t get me wrong – I think the man’s a genius) who say they don’t feel an emotional connection to such a thing, so therefore, they don’t bother studying it. Friend: Many religious people require that all things G_d are mysterious and cannot be understood. Proven facts are then rejected based on the disposition that they are understandable. Me: I don’t subscribe to that view. There are plenty of not-very-deep thinking people out there. Belief in G_d doesn’t seem to be an indicator of how deeply thinking a person is. Friend: For example, the sequencing of the human genome has been done with a “sufficient number of light sources” to be undeniable fact. Me: I don’t see the point in arguing along these lines … I agree with you. But it doesn’t change the existence or lack thereof further dimensions simply because someone isn’t too bright. Friend: Okay. i see your point now. Me: Or, turn it around – someone saying “there’s a sequenced genome” or “there’s a fossil” so therefore there is no G_d … is equally not very bright. Friend: Such a statement would not be very bright. A better conclusion would be that Gd is now understood a way that is different than previously believed. Me: I agree with that. Friend: Only the nature of the conjecture changes based upon emotion, the proof or disproof of that conjecture never changes. Me: Pretty much. I look at someone like DeGrasse Tyson [who argues there is no G_d because why would G_d create a universe where life can’t exist in most of it and is “trying to kill us] and I just can’t get there. Why would you want to look at the world as full of death and destruction? Friend: A very religious person may perform different experiments, but there is no denying the facts that result. Me: Agreed … though we may not understand all the factors, etc. Friend: How I feel about the conclusion (i.e. death and destruction) does not change the facts that lead to the conclusion. For example, those three sources of light that found a tumor . . . I do not like that. Me: It’s a point of view. You can focus on those facts, or you focus on the amazing things that is the universe, the creation of life, and that it’s all for the best. Same facts, different starting conjecture…. I choose my version. Tyson’s view is pretty depressing. Yes, depressing is an emotion and this is an emotional response, but one that seems rational to me. Friend: But what about the tumor that the three sources of x-ray have irrefutable illuminated? is it not really there because it makes you feel sad? Me: Of course it’s there, but why do I have to feel sad? Friend: Why do you have to feel sad about the evidence in which Neil Tyson conveys? Me: I don’t feel sad about the evidence. I feel sad about the conjecture and conclusion he draws. Friend: Asimov’s assertion is that such sadness may keep you from getting the cat scan. Someone else may not have the same bias (the doctor while you are in a coma and cannot give consent). Now you are faced with the facts. Who cares about your bias now? Me: I don’t see how you get to Asimov’s assertion. In any case, I do believe your bias matters. That’s the placebo effect. Happier people live longer. Holocaust survivors have this uncanny way of living really long lives, on average. People who want life, get it. Friend: YOUR bias matters in what YOU do. Others will still present information that is irrefutable that YOU would have never tested. Friend: Like you’re tumor that was discovered while you were in a coma that you would have never looked for. Me: Ah. Let’s pre-suppsoe for a second that calling to a higher power works. Let’s further support that if your friends and family don’t try it, then you die. If they do try it, then you come out of the coma. In Jewish belief (I can’t speak for other religions, and can barely speak for Judaism) you’d be responsible for not praying. Friend: Let’s pre-suppose that asking the higher power for things upsets him and the result will be much more favorable if i live him alone. Who is right? how do you know? Me: Okay… that goes back to a very negative world view. That would actually be more ‘sad’ than Tyson’s. If that’s the case, we’re all in trouble. What your proposing is the “reverse Pascal wager”. It’s an argument based on extreme negativity which is better suited to winning arguments than trying to live a life of pleasure. Friend: It is not my disposition. its just a way of establishing logical fact. its is valid to take the converse of any logical statement. Me: From a purely logical perspective, you are right … I do not know for sure that the converse isn’t true. Friend: When dealing with tumors and global warming, it is important to deal only with facts. Me: Agreed, but we might look at it very differently. Why do you care about global warming? You die anyway, done. Friend: Who said anything about being done when you die? Me: Will global warming effect you after you die? Friend: My children and their children. Me: How does that effect YOU? Friend: it is not necessary to take such an egocentric view. The ego is just a survival tool. it is not all that we are. Me: So now you’re getting into the unobservable. What are we after death, in your view? Friend: Our genome is propagated through our children. The sense of ego is as extraneous and useless defining a ‘computer’ in the internet cloud. Its just not relevent in that sense. where are your digital pictures? Does it matter? They can be in 500 places. Me: So the purpose of existence is survival? Whose geome can last longest? Friend: This is a concept that is fairly well understood. Many religious people don’t like things that are understood. They require that the explanations all remain secret and mysterious. Me: So why do you want to propagate your genome? Friend: This is the nature of life. Friend: We were made that way. We also can understand some of how and why we are made and how we operate. There is no requirement that we deny these things. Me: So what? To use converse logic / Tyson logic … if the world is almost entirely death and destruction anyway, why bring more people into it? Friend: its not what we do or how we are designed. Me: Why does near term vs. far term matter either? Global warming? What about the sun exploding. Friend: Our design does not account for our near or far term predictions of the universe. Me: Your answer is akin to a person traveling down a stream on a boat rowing because that’s what boat’s do. They never stop thinking about how they got on the boat or the waterfall ahead. Friend: We may also know that the waterfall ahead is not a death sentence for which we should put a bullet in our head right now. Me: Maybe. I think that’s my point. Except in the end, we all die and according to scientific theory, so does our genome. Friend: …and that the waterfall really is ahead even if we don’t want it to be. We don’t argue that the waterfall is not ahead because it makes us sad. Me: No, but that’s a silly way to live life. This is conjecture, but I think that life should be about maximizing pleasure. I start with that postulate and another one of free will. Friend: i’m not arguing against that. Me: I think my conjecture leading to belief is pretty simple: maximize pleasure + free will … and see where that takes me. This is where it did [to become a Torah observant Jew] …and does. I have yet to hear any counter to that to convince me otherwise. This is where non-theists lose me. Friend: i do argue that earth is much older, however. Me: Agreed. That was the largest thing which held me back, actually. I agree that the world is much older. Friend: How did you come to this conclusion? Me: Reviewing the evidence for and against. However, I do not really *know*. It’s perfectly logical to say that G_d created a world that only looked old, even if not satisfactory to say so. Friend: We have better information than that. We have information illuminated by a sufficient number of light sources. Me: I don’t see how we can know. We examine data and conclude based on it, but we can never have all the data about what happened 13 billion years ago. Friend: Age of the universe is a harder question than the age of the earth. Me: There are a bunch of theories, interpretations, et al. as to how to understand the Biblical account of creation with the age of universe / earth. The most appealing to a rationalist is probably Gerald Schroeder’s. He’s a MIT physicist and writes books on the subject. The short version of his answer is that the biblical account is from the point of creation, using relativity … it’s measuring 24 hour cycles of time from that point, when the light returns back there. It’s an accelerating frame of reference, so each day, if you calculate it, is half as long as the last. Once Adam is giving a human soul (breath of life), the frame of reference switches to earth. This is day 1 (Rosh Hashana) on our calendar … though this is day 6 of creation. Friend: it helps to formulate a general model of any unknown system so that you can even think of the next experiment to perform in order to put together the big picture conclusion…eventually. Me: I hear… so it’s about knowledge and knowing more, but to what end? There’s no ultimate purpose in any of it from an atheistic perspective other than an Asimov-type “I’m happy and don’t need more” sort of argument, as he once said. Friend: Okay. You need to work on an overly convoluted bridge that now reconciles evolution in the framework of Genesis. Me: It works out quite well. The Bible’s concern is not teaching science. If the theory is correct, billions of years are condensed into about 24 sentences. Why Genesis is there at all, is a better question. Friend: You have only reconciled age of the earth. You need an equivalent reconciliation for evolution. To counter the age of U and evolution challenges to the Bible, I would have asserted that Divine prophesy is more direct evidence–more illuminating light if you will–to the truth of Genesis than the secondary evidence against it that needs enormous doses of extrapolation. You would then of course have to explain why it is rational to believe in prophesy and why you are confident in our tradition about people having receiving Divine prophesy, but at least that puts the ball squarely in your court instead of having to pull out Schroeder and play in his court. Yes, I know what you think of the ‘schroeder’ card and I’m familiar with R’Meiselman’s approach of not putting the Torah in the “one down” position but rather letting it stand on it’s own. I understand the emotional reasons for doing so, but it is only after being frum for many years that I can get myself there. If that’s what you told me when I was a secular Jew, I would have laughed at the argument because on either side, we have to analyze the data. Both prophecy and age of the universe require extrapolation as they cannot be directly tested. The data known to a secular Jew (especially one who is has a higher science degree) is going to be in scientific fields where much of the supporting data is verifiable. Though this is also true for the supporting data for prophecy (e.g. the existence of the Jews) when you’re talking to someone who is steeped in and holds a near-religious belief in modern science, a direct confrontation with it doesn’t get too far.